My brother wanted to try fugu and so we went. I must say I was not disappointed. The staff at the restaurant were very welcoming and kind. The meal itself was delicious. Overall a fantastic experience. This is my first time in Japan, and I am traveling solo. It was quite the spontaneous trip but I've always know I wanted to try fugu. Today that became a reality. Fugu Fukuji wasn't too hard to find but I only speak and read English so it was a bit of an interesting time trying to pinpoint this place. When I arrived, I was warmly greeted and found myself in a nice and cozy restaurant. Although you could probably get away with not knowing Japanese, I stated in my reservation comments that I only speak English and was accommodated with an English speaking waitress. There are 2 set menu choices, as well as a la carte options as well. I chose the Bamboo set menu option. The first course was a snail and fugu jelly appetizer (which may vary) and was quite delicious. The next course was the famous fugu sashimi that everyone pictures when you hear of eating puffer fish in Japan. This was followed by the fugu hotpot and then rice porridge. 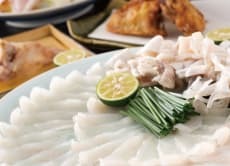 While I was eating, I found it interesting and realized that the broth used in the fugu hotpot and was then used as the base for the rice porridge so that you could taste all the flavours absorbed by the broth. Pickled vegetables are also served, and then fruit of the day for dessert (I had orange slices). I really appreciated when the chefs took the time to explain dishes and got to know me on a more personal level. All the staff was very friendly and enthusiastic about the whole dinner service. Thanks so much for kind support from Voyagin, did try to book restaurant for us. We did enjoy this restaurant. Will seek for Voyagin's recommendation next time.